Paid vacations are another element of compensation that many employees receive. In addition to paid vacations, employers may provide for other periods of compensated absences. Examples include sick leave, holidays, family emergency time, jury duty time, military reserve time, and so forth. Sometimes, these benefits accumulate with the passage of time, so that the benefit is a function of tenure with the company. To illustrate, a company may stipulate that one half-day of sick leave and one day of vacation time is accrued for each month of employment. Because the cost of periods of compensated absence can become quite significant, it is imperative that such amounts be correctly measured and reported. Accounting rules provide that companies expense (debit) and provide a liability (credit) for such accumulated costs when specified conditions are present. Those conditions are that the accumulated benefit (1) relates to services already rendered, (2) is a right that vests or accumulates, (3) is probable to be paid to the employee, and (4) can be reasonably estimated. Vacation pay typically meets these conditions for accrual, while other costs depend upon the individual company’s policies and history. It is common for a company to offer some form of retirement plan for its employees. Begin by noting that there are two broad types of pensions: defined contribution plans and defined benefit plans. With a defined contribution plan, an employer promises to make a periodic contribution (usually a set percentage of the employee’s salary with some matching portion also provided by the employee) into a separate pension fund account. After a minimum vesting period, the funds become the property of the employee for his or her benefit once they enter retirement. Prior to withdrawal, the funds might be invested in stocks, bonds, or other approved investments. The employee will receive the full benefit of the funds and the investment returns, usually withdrawing them gradually after retirement. Defined contribution plans offer an important desirable feature for employers, in that their obligation is known and fixed. Further, the employer ordinarily gets a tax deduction for its contribution, even though the employee does not recognize that contribution as taxable income until amounts are withdrawn from the pension many years later. The company expenses the required periodic contribution as incurred. No further accounting on the corporate books is necessary. The pension assets and obligations are effectively transferred to a separate pension trust, greatly simplifying the recordkeeping of the employer. In stark contrast are defined benefit plans. With these plans the employer’s promise becomes more elaborate and its cost far more uncertain. For example, a company may offer annual pension payments equal to 2% per year of service times the final annual salary. So, a person who works 30 years and then retires may be eligible for continuing pay at 60% of his or her annual salary. These plans are fraught with uncertainty. How long will retirees live and draw benefits, how many years will employees work, how much will the annual salary be, and so on? Actuaries are persons trained and skilled to make assessments about life expectancy and related workforce trends. They prepare estimates that are used by accountants to calculate annual pension expense for a defined benefit plan. Matching concepts expense this cost during the periods of active employee service, rather than periods of retirement. Some or all of the annual expense is funded by a transfer of money into a pension trust fund. Those funds are invested and eventually disbursed to retirees, but the company remains obligated for any shortfalls in the pension trust. If a company has failed to fund all the amounts expensed to date, or if the pension fund is “underfunded” relative to outstanding pension promises made, a pension liability is reported on the balance sheet. But, the bulk of the pension assets and obligations are carried on the books of the separate pension trust fund. Because of reporting complexities and actuarial risks, defined benefit pension plans are becoming less common. Some companies provide retirees with health care coverage, prescription benefits, and life insurance. Matching principles again dictate that such costs be expensed during the period of time in which the employee is actively working to vest these rights. As a result, companies will expense the estimated cost of post-retirement benefits over many years, creating an offsetting liability on the balance sheet. What is a compensated absence? What criteria signal the need to record a liability for a future period of compensated absence? Be able to describe the appropriate accounting for vacation pay. Generally, describe the nature of a defined contribution pension plan. 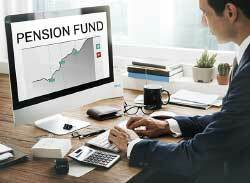 Generally, describe the nature of a defined benefit pension plan. Generally, describe postretirement health-care benefits and the related accounting consequences.